MUNYONYO – President Museveni has said dialogue is the beginning of democracy and wondered why some leaders would not want to discuss political problems. 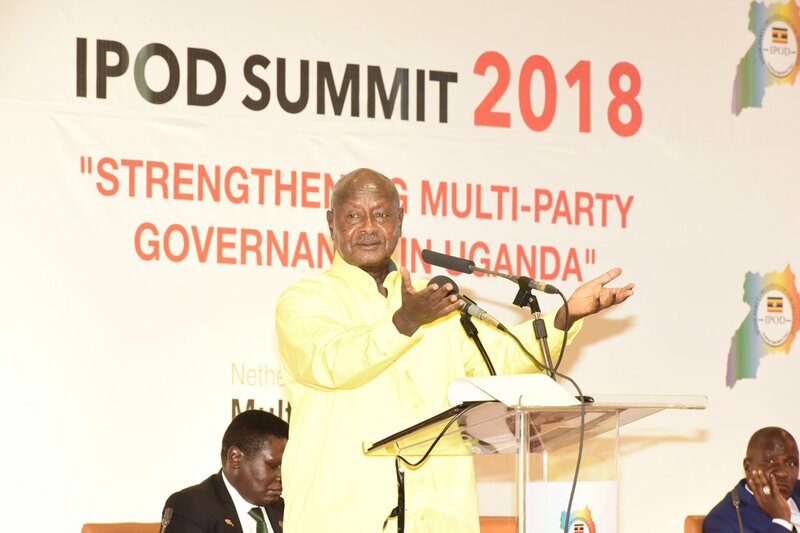 Speaking at the Inter-party Organisations Dialogue (IPOD) summit in Kampala on Wednesday, Mr Museveni who attended as the ruling NRM party chairman said he has always been willing to talk with his opponents. “I’m very happy to attend this dialogue because dialogue is the beginning of democracy. I don’t know why anybody who says he’s a democrat wouldn’t want dialogue, I always welcome the opportunity to dialogue. When you don’t dialogue, you miss opportunities to be understood clearly. Dialogue is a command from God. When I come out and say I want to lead people but then I don’t want to talk to so and so, that means I’m betraying my mandate,” he said in an apparent swipe at the Forum for Democratic Change (FDC) party that opted to keep away from the summit. Founded in 2009, Ipod is a forum for leaders of political parties with representation in Parliament to engage on matters of common interest. Only four political parties have confirmed participation and these include; Uganda People’s Congress (UPC) DP, Justice Forum (Jeema) and National Resistance Movement (NRM). “I’m not part of those who don’t want to talk and I’ve never been. You can’t say you’re a leader but you don’t want to talk, it doesn’t mean that when you talk you agree, it means you’ve put your point across. I didn’t have to join politics, even today, I don’t have to be in politics because I have my job as a cattle keeper, I’m not a ruler. My job is cattle keeping and if you want to know, I’m the first from my family to be in government,” he added. The President also lashed at the Opposition who he said do not support his government in implementing key projects necessary for the transformation of the country. “The Opposition is in danger of being whipped out because you miscalculate, you allow the NRM to be the one to solve the problems alone because you take the wrong position. What will whip you out is not that I say, it’s what you fail to do and what NRM does alone. When we succeed alone, how will you survive? Right now, Uganda is exporting more to Kenya than what Kenya is exporting to Uganda and we’re just starting, people who are worried about this started attacking Chinese and robbing them, they want them to run away but we’ve now come in and we’re going to get them. These criminals caused some casualties, they killed Abiriga, Kaweesi, the Moslem clerics but we’re going to defeat them, and when we do succeed, I’ll say I fought alone, the opposition didn’t help,” Mr Museveni said. “In fact, the Opposition is surviving partly because of the mistakes, weaknesses and failures of our leaders who don’t implement things properly. If they did you would actually perish. I’m in this dialogue as a matter of principle and it’s so much welcome. However, the question is, what do we dialogue on? I’m surprised that some people have been avoiding dialogue which implies that there is a problem,” he added. At the IPOD summit, opposition leaders, particularly Jeema’s Asuman Basalirwa, accused Mr Museveni of suffocating political space through police blocking opposition rallies and holding people under arrest beyond the stipulated period allowed in the constitution. “Hon. Basalirwa has rightly convicted the Police and I totally agree, they should be more organized. The problem of assembly is not an issue, the only problem is the venue, what is your intention, and the message, what message are you giving? Political actors, you can have any other dreams but forget about chaos, then we shall not have a problem,” he said. “On the issue of torture, we’re totally against torture but what you should know is that this country is growing, the soldiers that were beating people in that viral video were wrong, I called them and explained that to them. However, they came in because of the indiscipline of the political actors. Despite these weaknesses, Uganda is very stable, we shall correct those people, these problems are curable,” he added.